The California Lemon Law is a law that is designed to protect California consumers if a warranted consumer good is defective. The Lemon Law applies to only warranted consumer goods. As a general rule, if the consumer good is not covered by warranty, the California Lemon Law will not apply. The California Lemon Law applies to new and used warranted goods. Generally, if a consumer good has a warranty problem that is subject to at least four repair attempts the good is considered to be a lemon. For motor vehicles the warranty problem must substantially impair the vehicle’s use, value or safety to the buyer or lessee. It should be noted that for safety related problems, as little as two repair attempts may establish the consumer good or motor vehicle as a lemon. If a consumer good or motor vehicle is determined to be a lemon, the buyer is entitled to a have the good repurchased or replaced by the warrantor. 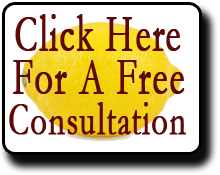 if you believe you may have a lemon consumer good or motor vehicle, please contact us and we would be happy to provide you with a free consultation.